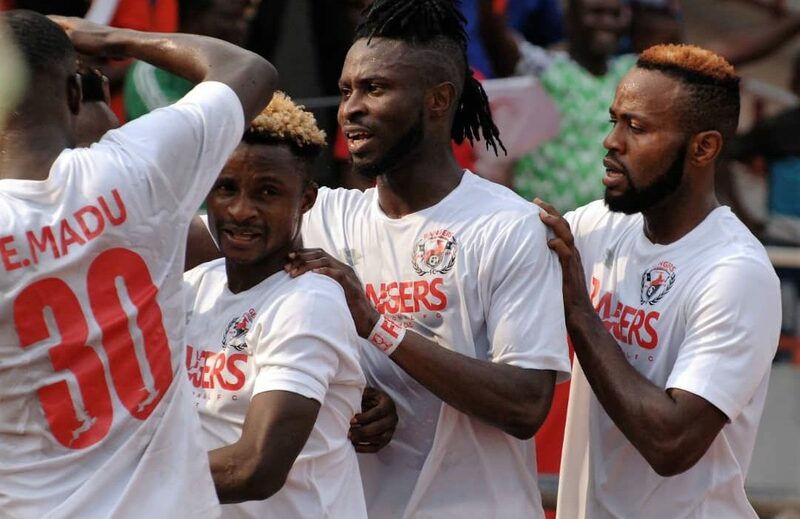 Striker Bobby Clement put up an inspired performance to help Nigerian Cup champions Rangers to a 1-1 draw away to Tunisian side CS Sfaxien in their CAF Confederation Cup second group stage game on Wednesday night. Clement, a key member of the Rangers side that won the league in 2016 made his first start for the club – since rejoining the side at the start of the season after a season long loan deal to Al Arabi Kuwait – and put in a superlative performance to aid his side’s point. After over an hour of coping admirably with the hosts’ antics and onslaught, Rangers went behind in the 71st minute after Alaeddine Marzouki was left unmarked inside the box to head home a right wing cross to send the home fans at the Taieb Mhri Stadium, Sfax in ecstasy. The joy was shortlived however as the Flying Antelopes responded barely two minutes later with Clement at the centre of it. The former Heartland forward who caused problems with his strength and hold-up play all evening won a free kick on the left flank which Beninoise left-back Isaac Loute expertly lofted into the box. Clement’s powerful header to meet Loute’s kick was kept out by Sfaxien goalkeeper Dahmen but Rangers’ Senegalese defender Pape Ousmane Sane was on hand to hammer home from three yards. Special mention must also go to Rangers goalkeeper Nana Bonsu who pulled off significant saves in both halves of the game to deny the hosts chances of taking advantage of the encounter. By the virtue of Wednesday’s result, Rangers remained the only unbeaten side in this season’s tournament with an impressive record of six wins and two draws. The Gbenga Ogunbote tutored side are sitting pretty much on top,of group B with four points from two matches, same as Sfaxien while Etoile Sportive du Sahel and Salitas who played out a 0-0 draw earlier on Wednesday have one point apiece. Rangers’ next game will be another trip to Tunisia to face Etoile at the Olympique Stadium in Sousse on Sunday February 24, 2019.